Now making their way in the world of folk-rock, two young alumni credit Stonehill with helping them get started in the music business. Part of the group The Ballroom Thieves, singer/songwriter Martin Earley ’10 and percussionist Devin Mauch ’11 met through the College’s music scene— open-mic nights at The Hill, Brother Mike’s, and student-run music nights in the senior courts. A Philosophy and Foreign Languages double-major, Earley began writing and performing his own songs while still a student. His songwriting eventually caught the ear of percussionist Mauch, a psychology and fine arts double major. “We started collaborating at the beginning of his (Earley’s) senior year at all the major music-related events on campus with me accompanying him on drums and vocals,” Mauch said. The duo had one music class together, but it was an impactful one with Assistant Professor of Visual and Performing Arts Lisa Redpath. The course was called Musical Instruments of the World. Both musicians mentioned Lina Macedo — Assistant Director of Student Activities for Campus Programs— for promoting and supporting their musical interests from the start. Still, neither knew they wanted to perform professionally until the summer of 2010 when they toured the U.S. 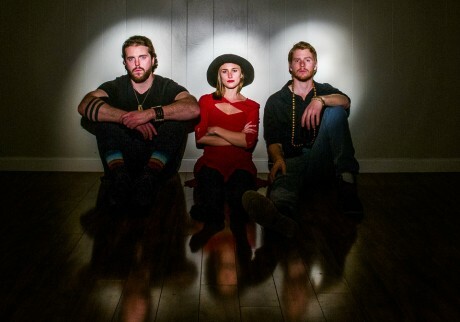 When the duo met cellist Calin Peters at the Lizard Lounge in Cambridge three years ago, the current folk-rock trio was born. This year, The Ballroom Thieves are on tour with stops in Connecticut, New York, West Virginia, New Hampshire, Maine, Pennsylvania, North Carolina, Tennessee, and Georgia. And, in early January, the band was nominated for Roots Act of the Year by the New England Music Awards. For more on the group, visit ballroomthieves.com. Just recently, the group also announced it would be playing at this year's Boston Calling Music Festival in May.